Why is religion privileged over philosophy? It’s a truth universally acknowledged that, at least in the U.S. (and certainly in Canada), the government defers far more to religious beliefs than to philosophical ones. There are Religious Freedom Restoration Acts (but no philosophical ones); when there was a military draft you could get a conscientious objector exemption if you were religious, but not if your objections were philosophical or moral (I got exempted because chaplains testified that my objections to war were quasi-religious); and many states will exculpate you if you injure your children by refusing to get them medical care on religious grounds, but not if you do so on philosophical grounds. Now I understand why the First Amendment guarantees people the right to practice their beliefs without interference, even if those beliefs, as in the case of Kim Davis, keep her from doing part of her job. But why religion and not philosophy? After all, one can argue that philosophical beliefs have a stronger claim on legal recognition, or at least on public “respect,” than do religious beliefs. First of all, most people get their religion via accidents of birth: if you’re born in Utah, you’re likely to be a Mormon, a Muslim if born in Saudi Arabia, and a Christian if born in Mississippi. That, of course, means those beliefs weren’t arrived at by reason but by cultural inheritance. Finally, philosophical views are often held just as tenaciously, and considered just as integral a part of a person’s “worldview”, as are religious beliefs. Think of pacifists and animal-rights activists. But there is one difference—something Lawrence Krauss touched on his his New Yorkerpiece. I’d rather have those with philosophical views try to impose them on me through government than those with religious views. For, at least in principle, philosophy is open to rational debate, while religion, as Lawrence noted, is not. Readers should weigh in below, as I really would like to know why religion is put on a pedestal in the U.S. while equally sincere philosophical views are not. In a brave and thoughtful soliloquy, Lawrence Krauss makes a powerful case against organized religion. Religion is a negative force for humanity because … it implies things about the real world that are just not true. [Religion] has provided opportunities for groups to sometimes do progressive things. But inevitably it’s based on myth and superstition, based on ideas created by Iron Age peasants who didn’t even know the Earth orbited the sun. And ultimately why we should view that as wisdom is beyond me. Now in the current world, I think there’s no doubt that right now Islam is a source of more violence than a number of the other organized religions. Islam is 500 years younger than say Christianity. And 500 years ago Christianity was producing far more violence than Islam ever is today from the Crusades to the Inquisition. … highly religious people take the Bible allegorically… when it says you can stone your children if they disobey you, no one takes that seriously anymore. The difference is that many people take the Koran every word of the Koran as not only divine but literally. And therefore when it exhorts you to violence they take that literally. That’s not done any more in the older religions, in the Abrahamic religions. The Bible still says to do those awful things but people don’t take it seriously. As the title indicates, the larger theme Krauss explicates is the “us vs. them” mentality that is inevitably associated with organized religion, a mentality which often triggers a dangerous form of xenophobia. … what seems to me the thing that we have to overcome the most is people recognizing that you can be a good person by accepting reality for what it is and questioning everything including questioning the existence of God. Bottom line: organized religion is a destructive and divisive force which implies things about the real world that are just not true. In addition, and perhaps more important: one can be good without God. Lawrence Krauss is a Canadian-American theoretical physicist who is a professor of physics, and the author of several bestselling books, including The Physics of Star Trek and A Universe from Nothing. is a form of child abuse. Krauss, appearing on the “The Weekly,” an Australian satirical TV news show, stressed the importance of teaching children critical thinking skills. But it’s true. I mean, there are different levels of child abuse. It’s like not allowing your children to have medicine, not allowing you children to be vaccinated, for example, is child abuse, because you are doing them harm. In some sense, if you withhold information from your children because you would rather them not know what reality is really like, for fear that it is going to affect their beliefs, then you are doing them harm. Krauss is correct. Preventing children from learning the truth about the world, like teaching children that creationism is an acceptable scientific explanation for the diversity of life on Earth, is a mild form of child abuse. Previously, in 2013, while appearing on The David Pakman Show, Krauss acknowledged that teaching creationism to children was not on the same level of abuse as sexual assault, but insisted it should still be considered abusive because it puts children at a disadvantage. If you’re introducing it (creationism or Intelligent Design) as reality, if you’re telling your kids the world is 6,000 years old, and they shouldn’t believe scientists because there is no way humans are related to other animals, and don’t believe any of that stuff you learned in school, or take you kids of out of school because they are learning something, then it is like the Taliban at some level, which is an extreme form of child abuse. Earlier this year, Krauss, and another leading scientist, Richard Dawkins, advocated for the intellectual rights of children, arguing children should be allowed to develop as critical thinkers and be protected from religious indoctrination. It seems clear to many rational people that forcing children to accept the religious superstitions of their parents can be a form of child abuse. And it follows that teaching children Biblical creationism as a legitimate scientific alternative to the theory of evolution is an example of such child abuse. Yet if we are to accept this claim, what are the implications for social policy? Should the government step in and protect children from the religious superstitions of their parents? Or should parents retain the right to force their religious beliefs upon their children, even when those beliefs are demonstrably harmful to the education of the child, as is the case with the teaching of creationism? And what about religious schools, as well as homeschoolers, engaged in the explicit task of indoctrinating children? How does society protect children from the damaging excesses of religion? How does society defend a child’s right to a proper education, even if that education violates the sincerely held religious beliefs of their parents? Lawrence Krauss is a theoretical physicist and cosmologist who is a professor of physics and director of the Origins Project at Arizona State University. He is also the author of the bestselling book, A Universe from Nothing: Why There Is Something Rather than Nothing. Black holes? Singularities? Unitarity? Some might wonder why the public should care about the esoteric, abstract work of Stephen Hawking. None of it will build a better toaster, after all. But Hawking’s work continues to drive physics at the very forefront — and ultimately may push us toward a theory that describes the very origin of our universe. Hawking’s interest in black holes — which changed his life, and the future of physics — started in 1970, five years after he was diagnosed with ALS. He was collaborating with another noted mathematical physicist, Roger Penrose, to show that the universe had to begin in an infinitely dense “singularity,” much like the final stages of black hole collapse. Black holes are objects that are so dense that even light cannot escape them. Hawking’s work helped support the claim that only the mass, charge and spin of a black hole could be discerned from the outside, and that no other information about what previously had fallen inside it could ever be discerned. However, when Hawking began to apply ideas from quantum mechanics to processes associated with black holes in 1974, he discovered something completely unexpected. Black holes can actually radiate particles. And that radiation causes the black hole to shrink, potentially to the point of disappearance. It is hard to overstate the impact of this realization. The effort to solve the “Black Hole Information Paradox” has helped drive much of the current thinking about fundamental physics — including the development of String Theory, an idea which attempted to unify Einstein’s General Relativity (which, prior to Hawking, was largely decoupled from the rest of physics) with Quantum Mechanics. Attempting to reconcile Quantum Mechanics with General Relativity may suggest — as both Hawking and I agree — that all the space and time of our universe might have arisen from Nothing as a spontaneous quantum fluctuation, without the need for any supernatural shenanigans. This, in turn, could help us grapple with questions that have been around since the dawn of human perception: How did the Universe begin? How might it end? What is our place in the cosmos? So, no improved toaster. But addressing these, and other fundamental questions about our existence — like art, music and literature — forms the very essence of what it means to be human. And Hawking’s intellectual bravery, his refusal to give up his quest for knowledge in the face of a debilitating illness, provides a remarkable tribute to the power of human will. Lawrence M. Krauss, a Canadian theoretical physicist and cosmologist, is Foundation Professor and Director of the Origins Project at Arizona State University. 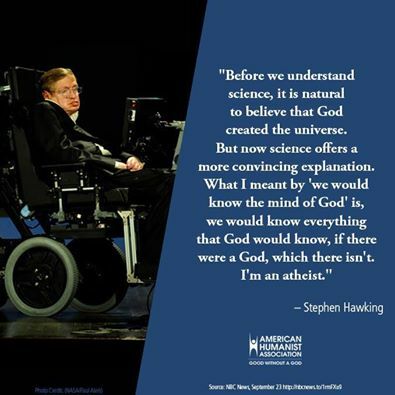 He is also the author of bestselling books including The Physics of Star Trek (with a foreword by Stephen Hawking) and A Universe from Nothing (with afterword by Richard Dawkins). “People should not assume that religion will always be a part of human society just because it has existed for so long, according to theoretical physicist Lawrence Krauss. Religion could disappear in the span of a single generation. “Religion is still very important to many Americans and it will be a very long time before we will live in a world without religion. It might not ever happen. However, we are getting much closer to that world, and before we know it, religious belief will occupy the same place as fortunetellers in our society. We are at the dawn of a new reality in America in which people are starting to be more interested in actual reality than they are in ancient superstitions. According to a 2012 Gallup-International poll (PDF), the number of “convinced atheists” in the United States has risen from 1 percent in 2005 to 5 percent in 2012. I want to point out here that we are not talking about some vague group of “nones,” or even people who shy away from the “A” label. That 5 percent doesn’t count those who only identify as agnostic or secular. It doesn’t count those who only use the Humanist or rationalist labels, either. We aren’t even talking about people who are just a little bit atheist; we are talking about “convinced atheists.” That’s 5 percent of the American public. Let’s put this in context with some religious group identities. Muslims make up just .6 percent of the population in America. Although you wouldn’t know that by watching Fox News or by listening to many religious fundamentalists who insist that Sharia Law is going to take over the country any day now. While Jewish groups have a strong lobby in Washington, they only make up 1.7 percent of the population in the nation. That’s it! Plus, there are still a lot of Jews who are secular and “convinced atheists.” So that number is probably inflated. There are more “convinced atheists” in America than all the Muslims and Jews combined and doubled. But that’s not all. Not by a long shot. Atheism is still considered a dirty word in much of this country. So there are a lot of people who lack a belief in gods but don’t call themselves atheists. The media loves the fact that according to the new Gallup tracking poll, the so-called “nones” only grew .3 percent from the previous year. Religious leaders are thrilled that the rise of the “nones” is slowing down. But the media reported it wrong. The “nones” are still rising! Looking at the context of how the other religious identities have risen or fallen, it becomes clear that this is a win for atheism. Protestants actually shrunk by .6 percent. Catholics can’t brag either. They fell .2 percent. Jews and Muslims stayed the same at the previously mentioned 1.7 percent and .6 percent, respectively. In fact, aside from the Mormons, no religious group increased their numbers in 2012. But the religiously unaffiliated did grow! The story shouldn’t have been that the rise of the “nones” was slowing down, but rather that the religiously unaffiliated is still the fastest growing religious identity. More people are leaving religion than joining religion. Even in the most Bible-minded cities in the country, 48 percent of people are “resistant” to the Bible. The religiously unaffiliated or “nones” make up about 19 percent of the American population. That’s nearly one in five Americans. I know, not all those people are “convinced atheists,” but the Pew Research Centerdoes break down those numbers a little bit and most of the “nones” don’t believe in any deities. So yeah,they’re atheists. Thirty-six percent of the “nones” are flat-out convinced atheists and agnostics. Thirty-nine percent consider themselves secular or not religious. 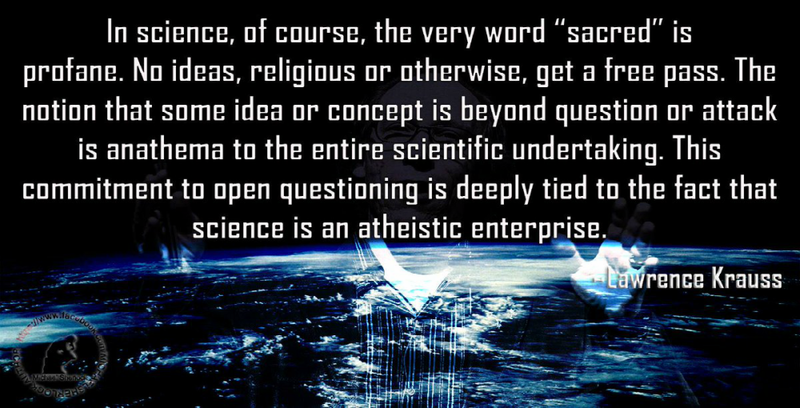 In other words, they don’t like to use the “A-labels” but they still don’t believe in any deities. Only 23 percent of the religiously unaffiliated “nones” consider themselves to be unattached believers. That means that 77 percent of the “nones” don’t believe in deities. That’s about 14 percent of the American people and 0 percent of Congress. While religious lawmakers continue to waste tax-payer money pushing laws that affirm “In God We Trust” as our national motto, it is their religious-based laws which continue to attack the rights of women, gays people and racial minorities that are most problematic. Those things aren’t helping religions grow one bit. On the contrary, they are making it easier for me to make my case that basing our laws on the Bible is silly and dangerous. It is much better to base our laws on secular values like human compassion, fairness and reason. As information becomes more available to the general public via the Internet, religion can no longer hide. When religious leaders make claims, people can now turn to Google and research those claims. You won’t find a religious leader claiming that there are no contradictions in the Bible anymore because a quick Google search can expose that as nonsense. That old line claiming that something can’t come from nothing is easily refuted with a YouTube search on Lawrence Krauss. Whether religious believers like it or not, we are at the dawn of a new godless age in America. Religious leaders know it and they are afraid. The greater community of reason is organizing and we are starting to demand equal treatment and representation. It won’t be long before we actually get it, either. Religious believers can deface our billboards, but they cannot prevent the inevitable reality that our message is getting out there. People are starting to think critically about the beliefs they have been indoctrinated to believe and they are leaving their religions behind.